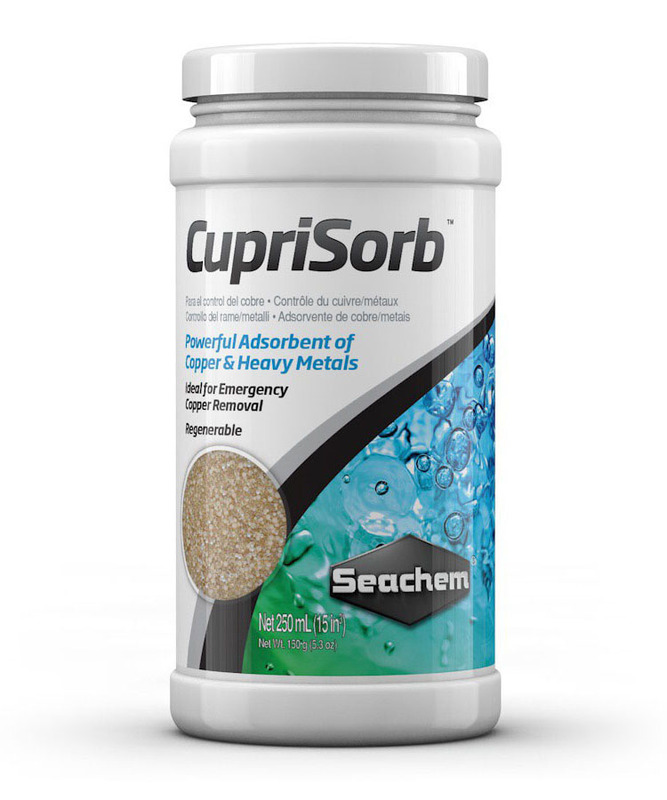 CupriSorb™ is a powerful adsorbent of copper and heavy metals. 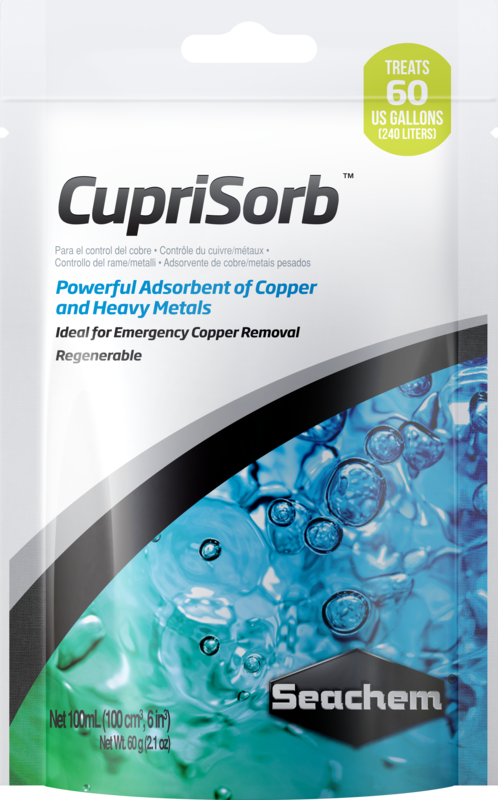 CupriSorb™ will remove copper more rapidly and efficiently than carbon and is thus ideal for emergency copper removal. It extracts all types of copper, including chelated copper, and remains effective until it turns a deep blue-black color. It may be regenerated repeatedly. If placed in continuous use, it will gradually extract even precipitated copper from the gravel/substrate bed as well. CupriSorb™ will allow maintenance of invertebrates in copper-treated tanks by removing copper leaching from substrates. 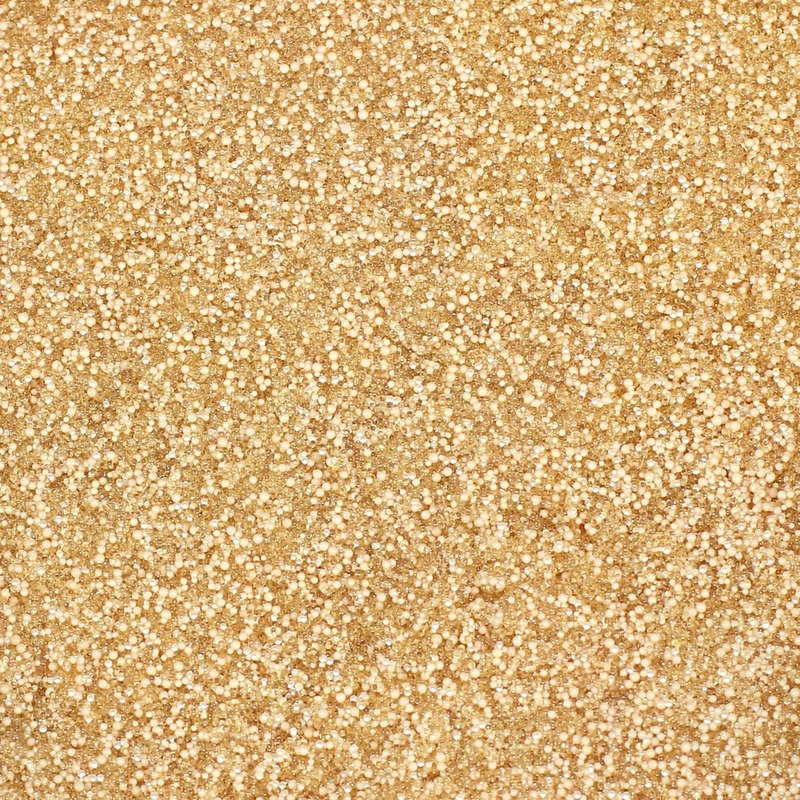 CupriSorb™ is a powerful copper specific chelating resin. Competing products are not chelating products, but merely cation exchange resins. Such resins can remove copper from freshwater but are ineffective in saltwater. Use 250 mL for every 600 L (150 US gallons) to remove up to 7,500 mg (12 ppm) of copper. Use in filter media bag such as The Bag™. 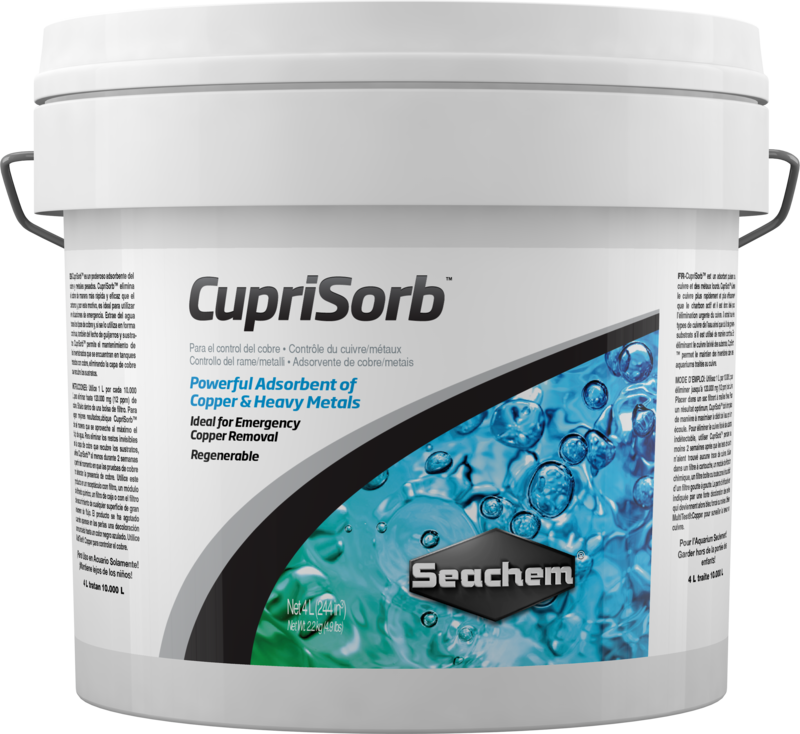 For best results, CupriSorb™ should be placed so as to maximize the flow of water through it. To remove undetectable substrate leaching copper keep CupriSorb™ in use for at least 2 weeks after copper tests report no copper. Use in a canister filter, chemical filtration module, box filter, or any high flow area of a trickle filter. Exhaustion is indicated by a pronounced discoloration of the beads to a deep blue black color. Use MultiTest™ Copper to monitor copper. When exhausted, CupriSorb™ may be discarded or regenerated. A: Exhaustion is indicated by a pronounced discoloration of the beads to a deep blue black color. When exhausted, CupriSorb™ may be discarded or regenerated. Regenerate by soaking bag or beads in a non-metal container with 2 cups of water and 1/2 cup of muriatic acid (available with pool supplies: PAY HEED TO WARNINGS on acid container!). This is better done outside and away from children. Soak for an hour, rinse well. Repeat as required to restore the original color. Rinse well, add backing soda (sodium bicarbonate) until foaming stops, and rinse again. CupriSorb™ is now ready for reuse. If original color cannot be restored after several acid washes, proceed with rinses and bicarbonate, then regenerate as HyperSorb™ or Purigen®. Use MultiTest: Copper to monitor copper. Will CupriSorb™ leach copper back into the water when exhausted? A: No. The copper is not released until you regenerate it. I have a wet/dry filter. Where is the best place to put CupriSorb™ for my setup? How effective is your CupriSorb™ at also removing iron and cadmium and led from water? A: It can also remove cadmium and iron. It may also remove lead, but we do not have any data on lead removal so we cannot guarantee it. Will CupriSorb™ effectively remove metals other than copper? I'm looking for a medium (preferably renewable) that will remove or at least significantly reduce all metals in my tap water. It will also remove nickel, zinc, cobalt, cadmium, manganese. it may remove other heavy metals but we have no data for any others. I am afraid of heavy metals building up in my tank. Can I leave CupriSorb™ in my filter permanently? A: It is fine to leave CupriSorb™ in your filter for an extended period of time if you are afraid that there is some source of heavy metals leaching into your water. However, many heavy metals are actually essential to the health of fish, corals, and invertebrates in trace amounts. Leaving CupriSorb™ in your filter may eventually deplete these essential trace elements completely, so we do not recommend CupriSorb™ as a permanent addition to your filter.